The Ford Fusion's tech features bring futuristic powers into the present. We here at Philpott Ford think the Fusion's tech features are partly why it remains the most popular mid-sized sedans. Here are two standout tech features that prove why. 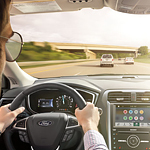 Fusion lets you incorporate your Android or iPhone into the hands-free operation afforded by SYNC 3, Ford's award-winning infotainment system. SYNC 3 interfaces with iPhone and Android, letting you access your phone's treasures through Siri or Google. You can use Apple CarPlay to play Apple Music, make phone calls, send messages or view maps. Similarly, you can connect to Google Now and Google Music, while Android Auto provides estimated travel time and voice-navigation. FordConnect tech creates a personal in-cabin Wi-Fi network with 4G LTE speeds powered by AT&T. The network has a wireless range of 50 feet and supports up to 10 devices at the same time. Discover the Ford Fusion for yourself. Visit our Ford showroom today for a test drive.